As the days stretch into weeks, and then weeks into months, the world around you forgets that this world you live in now is not the world as it should have been. Few seem to realize that you have fallen into a parallel universe, an alternative reality that is so fundamentally different from all that you had once dreamed and planned. In some alternate version of my life, my days now would be spent frantically changing diapers, filling bottles, and struggling to comfort two crying babies with too few arms, and through delirious exhaustion, I would marvel in wonder and awe at every hellish joy of parenthood. Instead, though, my nights are now sleepless as I rush to the hospital in my work with the families of organ donors to comfort other families as they too enter into their own parallel universe of grief. I journey with them into the shock of this new, unfamiliar realm, using my own pain to help guide the way. It is meaningful work, which I find indescribably fulfilling. But it is still not the same world as before. The hit Netflix series “Stranger Things” calls a world like this the “Upside Down.” Everything in this alternate universe looks eerily familiar to the world as it actually exists. The house is the same, for example. Even the children’s fort in the backyard – or in our case, the babies’ nursery – is still there. However, its innocence is lost. Instead, in this Upside Down world, what was once innocent and innocuous is now dark and dangerous and deadly. I can think of no better description for the underworld of grief. 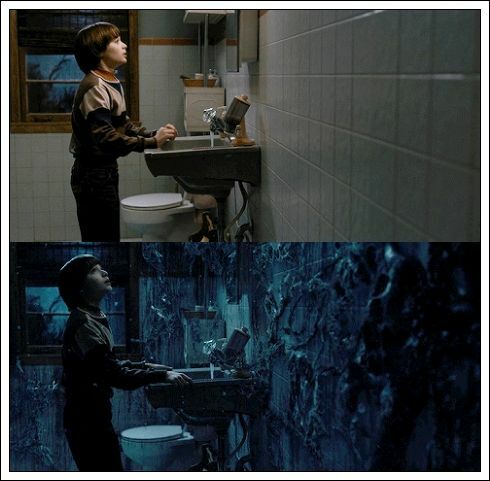 A scene of the “Upside Down” in Netflix’s Stranger Things. The mythos of grief is that it is a journey through the darkness to a mythical place called “Acceptance.” Others expect that “time will heal all wounds,” and with time, you will find your way back from this underworld to the world of the living. In the time that has passed, I have embraced my new role as Grief Guide, shining a light through the impenetrable darkness of this underworld to help show others the way. Through helping others, I have found a profound sense of purpose that has given the senselessness of what we have endured at least some measure of meaning. In my work to comfort others, I have miraculously found my own healing. However, I have come to learn that “Acceptance” may not be back among the world of the living after all. I am too fundamentally different to be the same person that I once was. And in other ways, I have found that the Land of the Living so fearfully denies death that it simply cannot accept Acceptance. Whenever I dare to say Ezra or Leo’s names out loud and see the faces of others flinch, for example, I know that my Acceptance is not accepted. This seems to be the general consensus of our death-denying culture. Still, I know that if reaching Acceptance means that I may never utter my sons’ names aloud again, it is a world that I want no part of. No, there must be an alternative to this alternate reality. This morning I found this world, caught between the darkness and the light, at our church’s All-Saints Day service. Today, along with churches and congregations everywhere, our church celebrated the lives of the saints that have gone on before us. During the service, the names of those loved ones who have died this year were read aloud, and in memory of each person that we have lost, someone would light a candle in their honor. The list tragically included dozens of names, which Patrick read aloud one-by-one from the pulpit. And one-by-one, candles were lit until together their light was so bright that it appeared that the whole table at the the front of the church had been set ablaze. Finally, Patrick read Ezra and Leo’s names from the list of saints. Read aloud, their names filled the sanctuary with the pain of their loss but, touchingly, also with the hope of their memory. I stepped forward, and with a long matchstick lit with light from the Christ Candle at the center of the table, I lit two tiny tealights in Ezra and Leo’s honor. In this one small moment, the worlds of light and dark collided. With their names read boldly aloud, we reminded the Land of the Living that Ezra and Leo had not been forgotten. They are remembered, and they are loved. And from that place, where pain and peace live together, I found true Acceptance. Thank you from the bottom of this grateful and forever humbled heart.